We are instrumental in manufacturing and supplying a quality range of PCD Step Reamers. Without compromising with quality, high quality components and spare parts are brought into use for manufacturing. Clients can avail these reamers from us in various configurations. 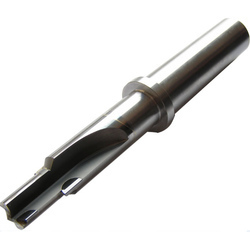 Being-customer oriented firm we are dedicated towards offering our clients with best series PCD Reamers. This is easy to use and very handy products. PCD Reamers are used to enlarge the hole with in close tolerance range, with high surface finish, concentricity and cylindricity. Metal removal rate is very less during reaming.Optimum condition is to remove 0.25mm from each side. Eskayjay Reamers are available in different shank diameters. The diameters are 4, 6, 8, 10, 12, 16, 20, 22, 25 and 32. Matching up with the ever increasing requirements of the customers, we are engaged in providing Diamond PCD Reamer. We Are One Of The Leading Manufacturers Supplier And Exporter Of PCD REMAER In Machine Tools Also We Are Dealing Various Sizes And Length Tools. We have counted as the topmost company, occupied in offering an impeccable collection of PCD Tipped Tools. Our vendors manufacture the offered tipped tools at vendor’s location by using quality assured material & finest technology. These tipped tools have earned a huge appreciation in the market for its performance. In order to cater to the numerous necessities of the patrons, we have been able to provide a wide range of PCD Reamer. Owing to the wide experience of this domain, we are instrumental in offering PCD Reamer to our clients.